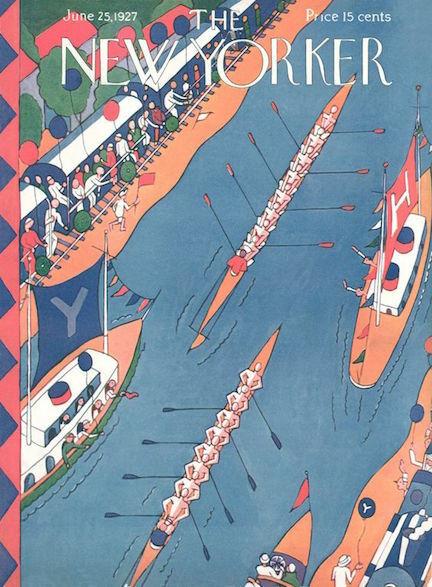 July 9, 1927 cover by Julian de Miskey. 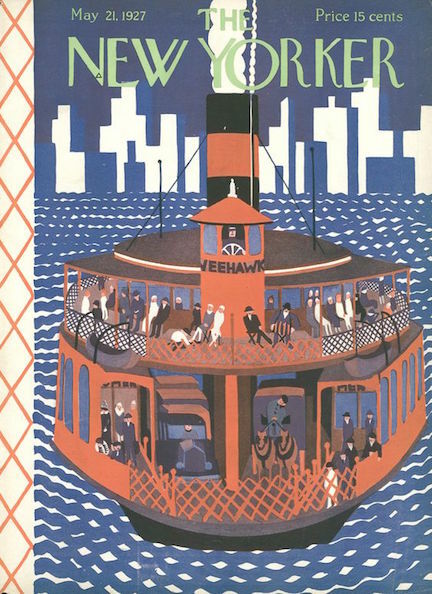 Born in Hungary in 1898, de Miskey emigrated to the United States in 1914. 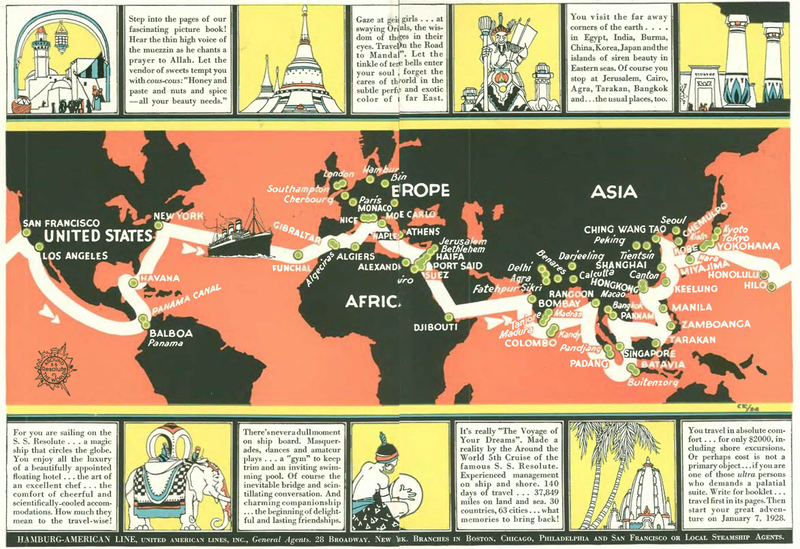 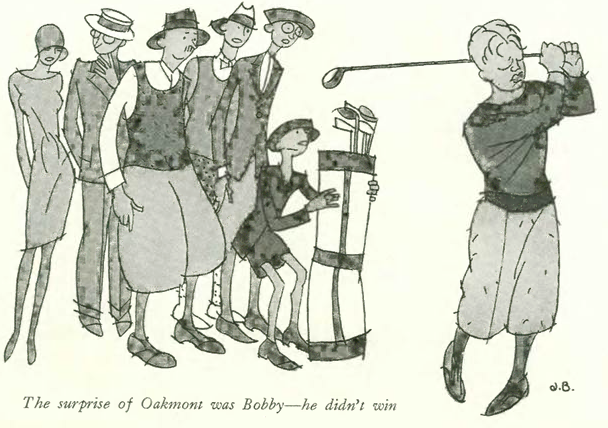 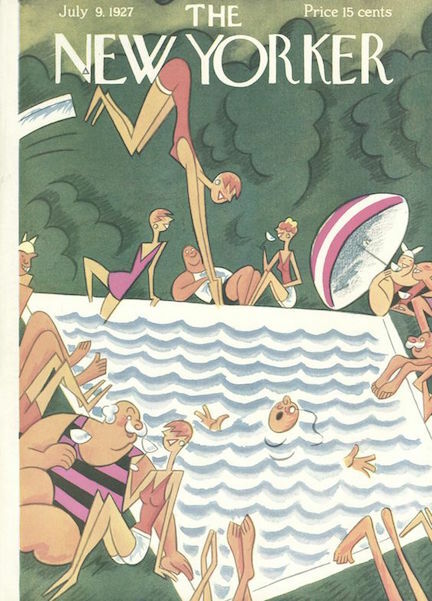 De Miskey did it all–spots, cartoons, and anywhere from 62 to 100 covers (varying numbers are reported). 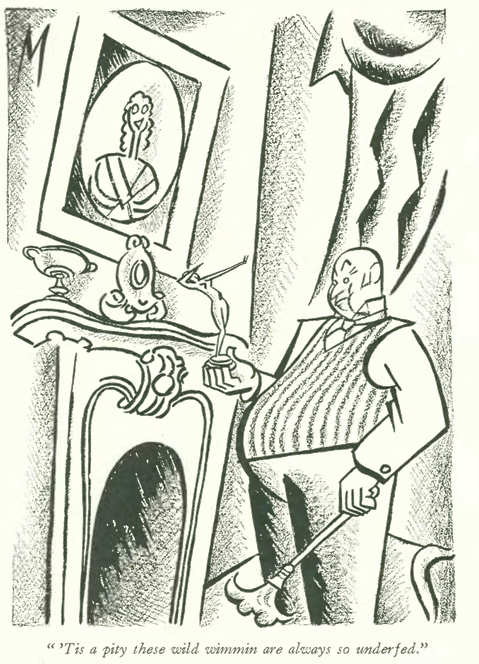 A member of the Woodstock Art Association, de Miskey was well known in the New York art circles of his day, rubbing elbows in the Whitney Studio Club in Manhattan with artists including Edward Hopper, Guy Pene du Bois, Mabel Dwight and Leon Kroll. 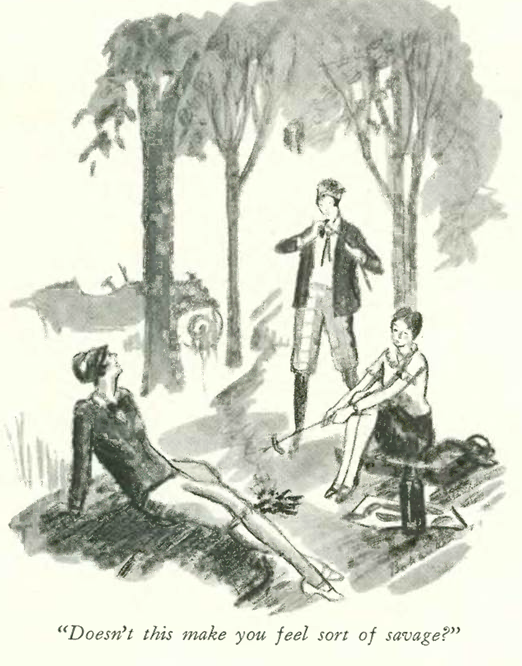 De Miskey also illustrated and designed covers for a number of books, studied sculpture and created stage sets and costume design. 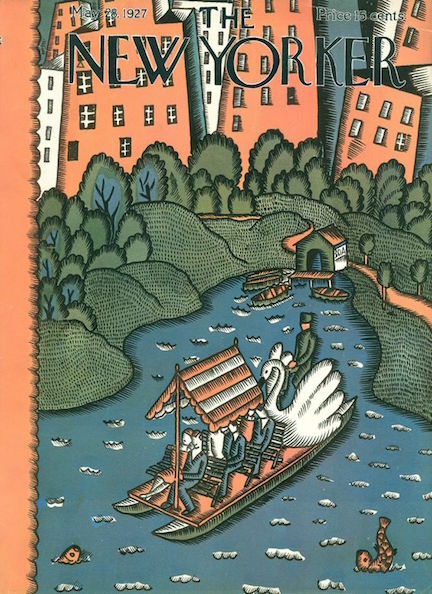 PROLIFIC…Julian de Miskey illustrated a number of children’s books, including Chúcaro: Wild Pony of the Pampa (1958-Newbery winner); The Trouble with Jenny’s Ear (1960); and Piccolo (1968) which was both written and illustrated by de Miskey. 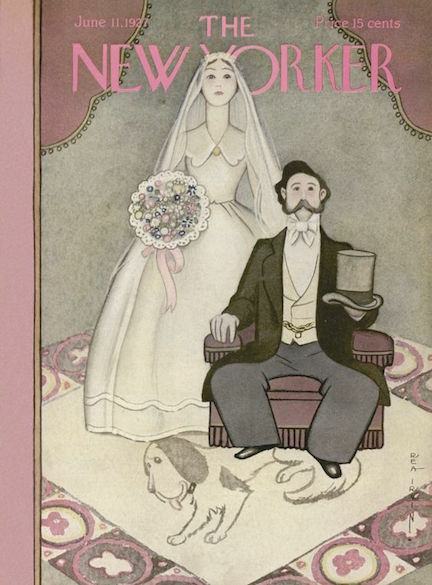 July 16, 1927 cover by Helen E. Hokinson. 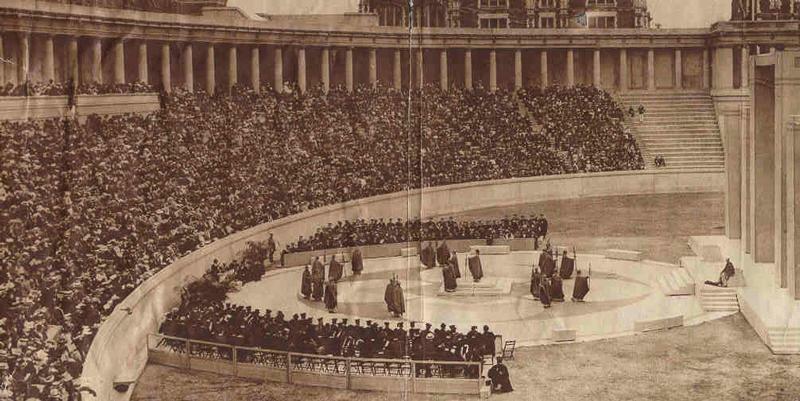 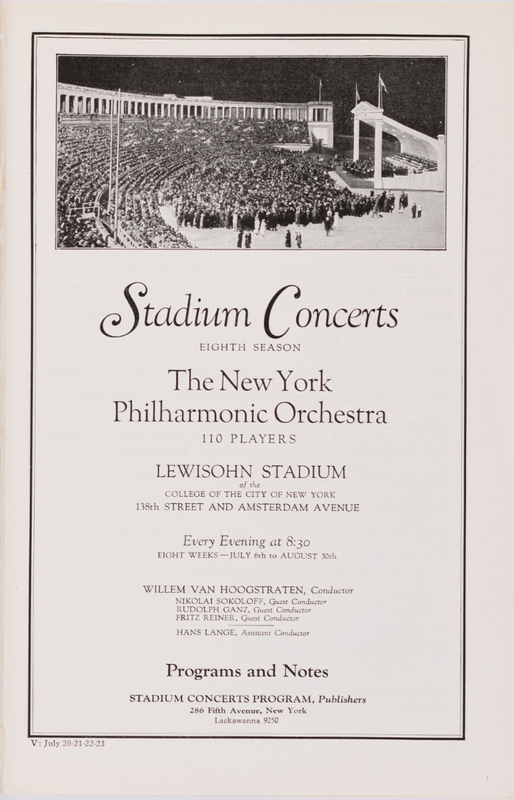 From 1918 to 1966, thousands of New Yorkers attended summer open-air concerts at Lewisohn Stadium, an amphitheater and athletic facility on the campus of the City College of New York. 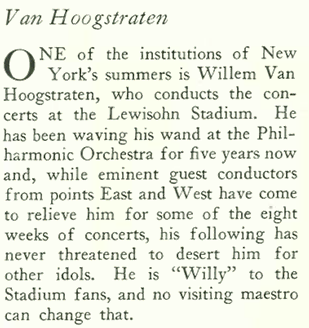 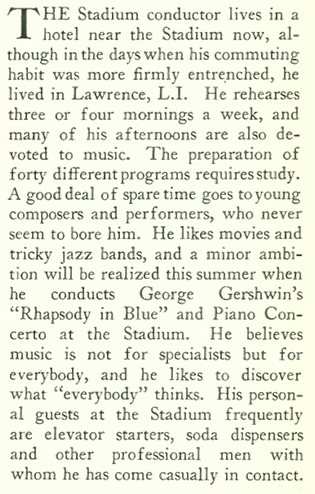 For many years Willem Van Hoogstraten conducted the nightly concerts, including the summer of 1927 when George Gershwin played his Rhapsody in Blue to adoring crowds. 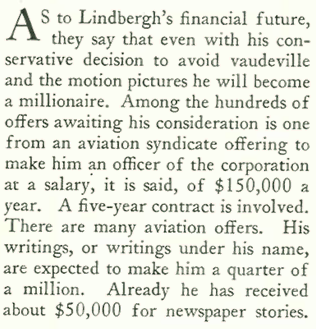 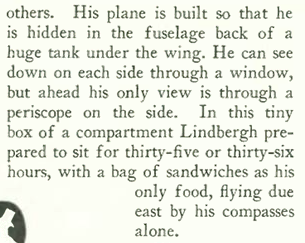 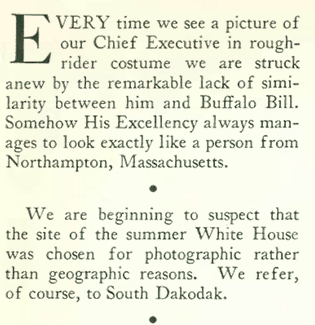 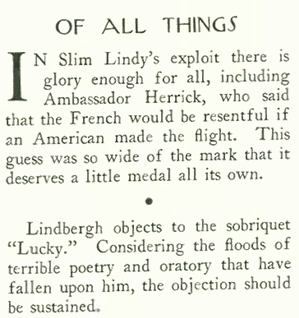 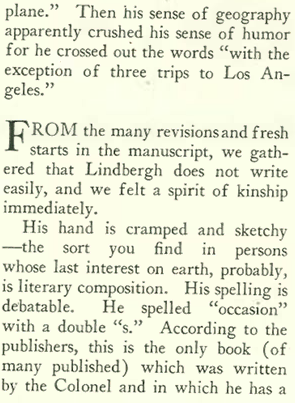 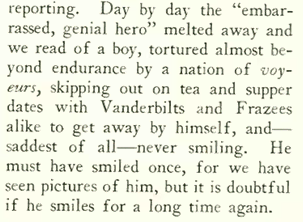 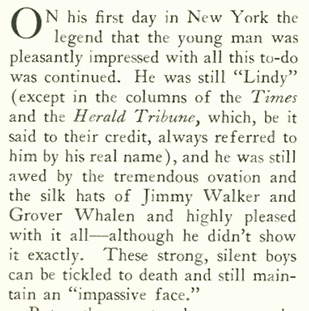 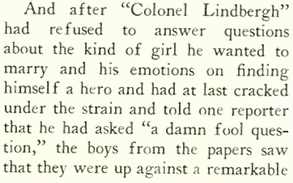 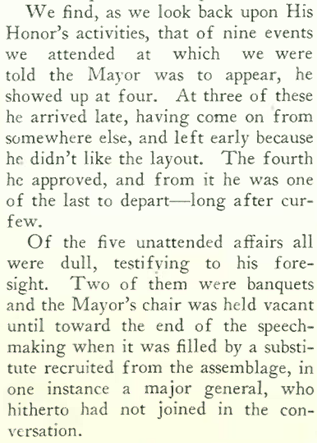 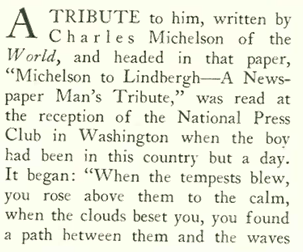 Charles Lindbergh was all over the July 2, 1927 issue of the New Yorker, which reported that Lindy was a better a flier than a writer, and as a celebrity the press had to be inventive with a subject who would rather be alone in a cockpit with a ham sandwich than be feted at countless banquets. 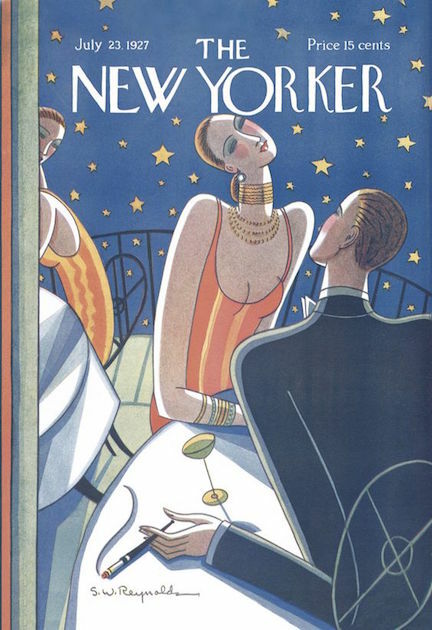 July 2, 1927 cover by Victor Bobritsky. 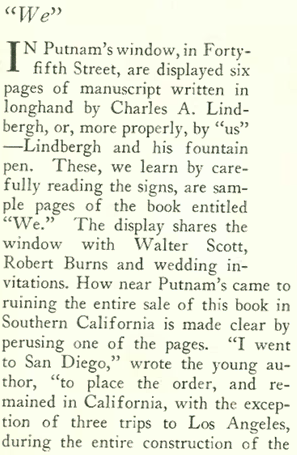 “The Talk of the Town” commented on the display at Putnam Publishing of a few manuscript pages penned by Lindbergh himself for his upcoming book, WE. 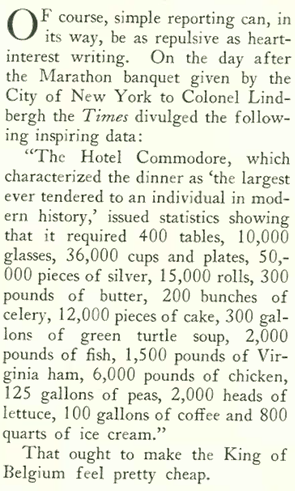 WHERE’S MY DAMN HAM SAMMICH?…Invitation to the WE banquet at the Hotel Commodore (Wikipedia). 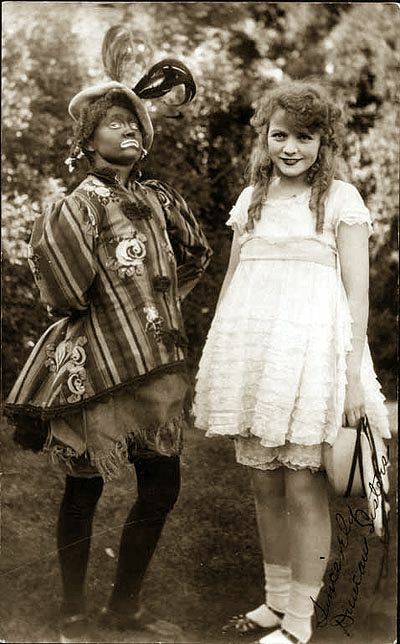 The Duncan Sisters were a vaudeville duo who created their stage identities in the 1923 musical comedy Topsy and Eva, derived from the novel Uncle Tom’s Cabin by Harriet Beecher Stowe. 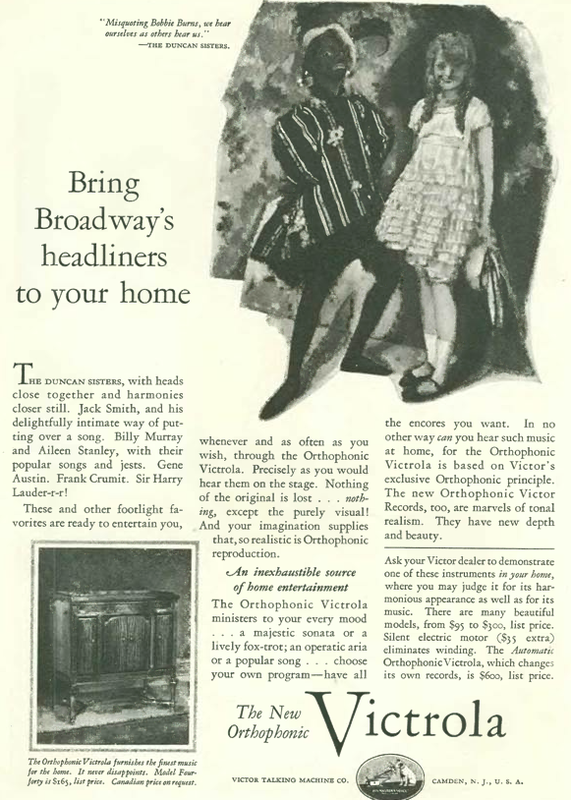 The musical was a big hit. 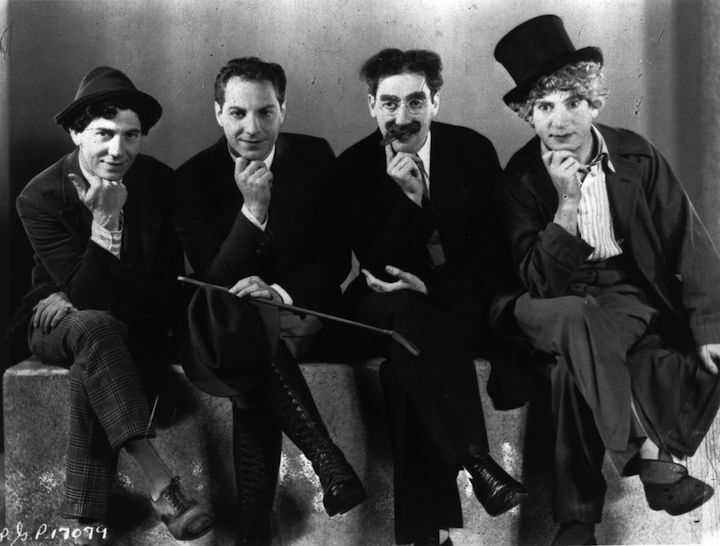 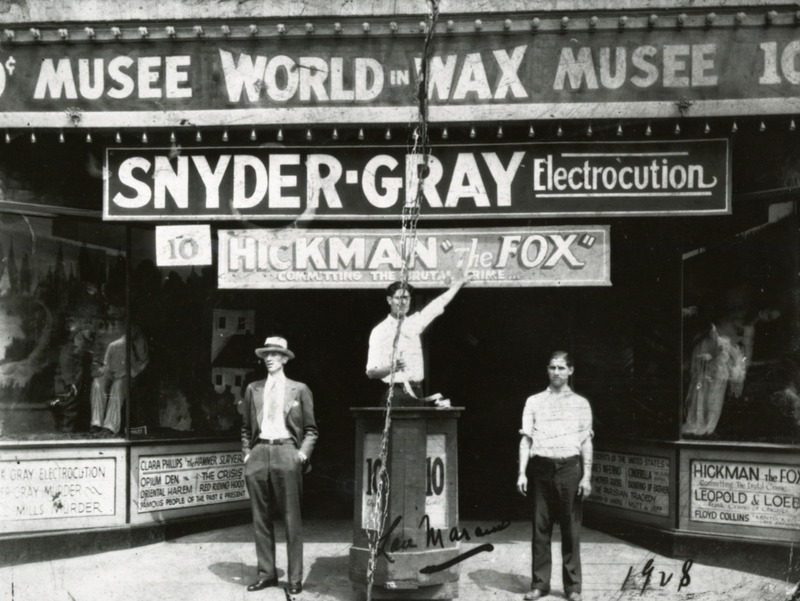 After a brief foray into movies in the early 1930s, the duo mostly entertained at night clubs and for many years continued to perform their Topsy and Eva routine even though appearing in blackface was considered impolite or offensive by later audiences. 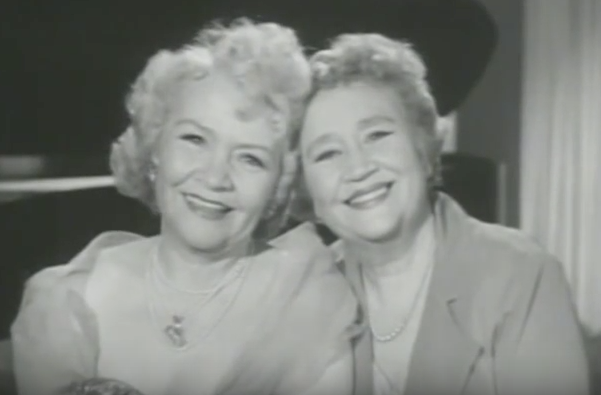 One of their final performances was on Liberace’s television show in 1956. 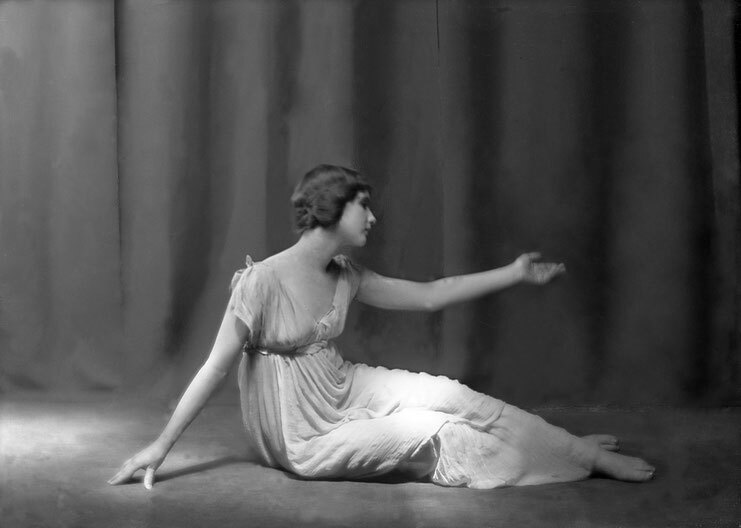 The act ended in 1959 when Rosetta died in a car accident. 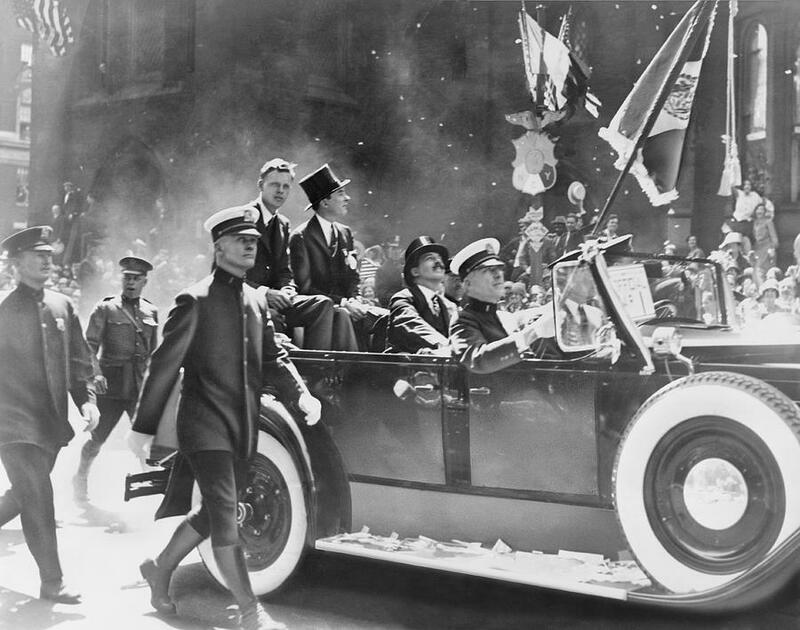 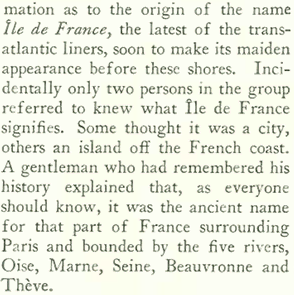 On June 22, 1927, the legendary French ocean-liner, the Île-de-France, traveled from Le Havre to New York on its maiden voyage, soon to be greeted by the American media and the thousands who would crowd the docks at New York Harbor to see the great ship. 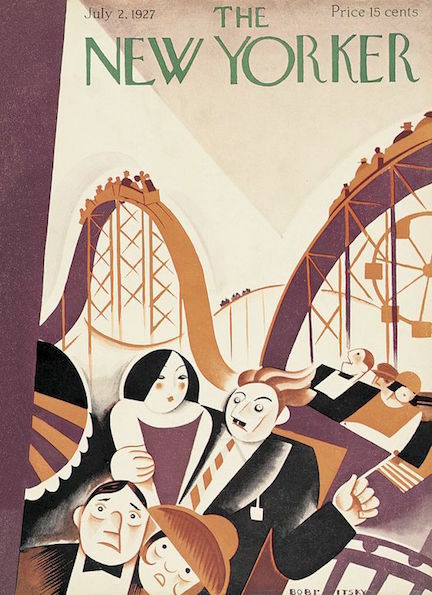 June 25, 1927 cover by Ilonka Karasz. 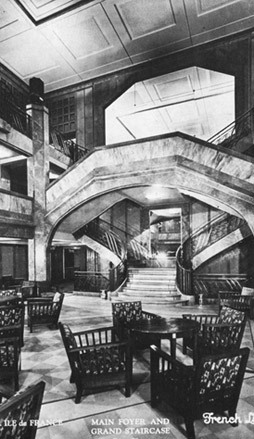 The Île-de-France was unique in that it was the first ocean-liner to have an interior design that didn’t imitate “shore-style” interiors that resembled rooms in manor houses or grand hotels. 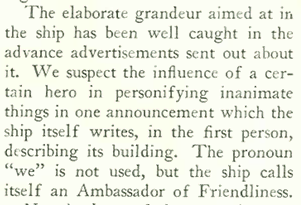 The trend-setting ship sported a modern, sleek, art deco look that celebrated the present and the future. 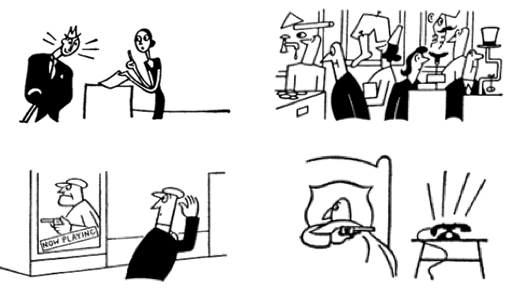 Note that these photos do not contain images of water slides or all-you-can eat buffets. 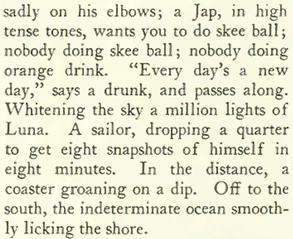 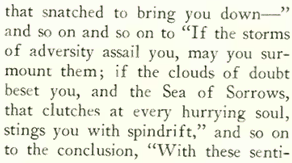 An ocean voyage, if you could afford it, was an elegant affair. 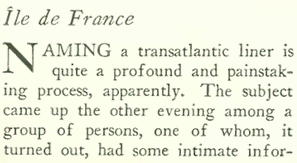 The Île-de-France was especially popular among wealthy Americans who liked its stylish, youthful vibe. 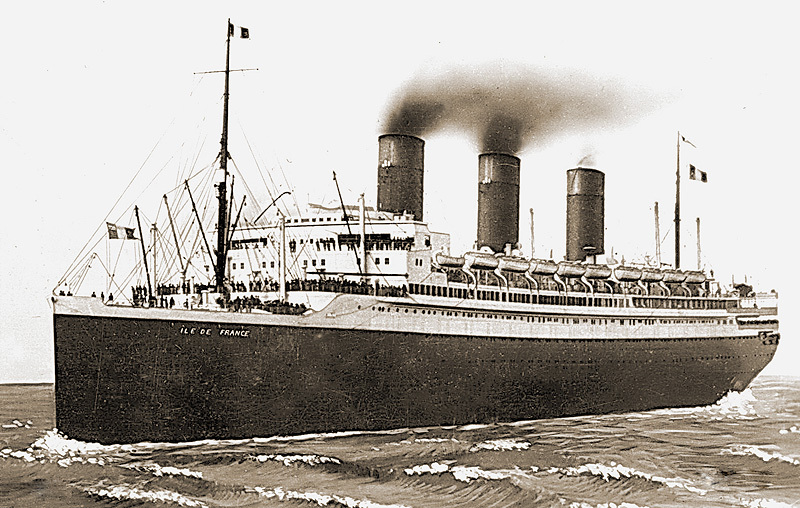 The Île-de-France served as a troop ship during World War II, and in 1956 played a major role in rescuing passengers from the sinking Andrea Doria off the coast of Nantucket. 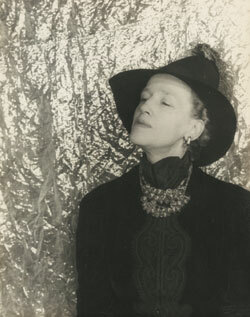 Unfortunately, anything that is youthful soon grows old, and as we all know, style is an ephemeral thing. 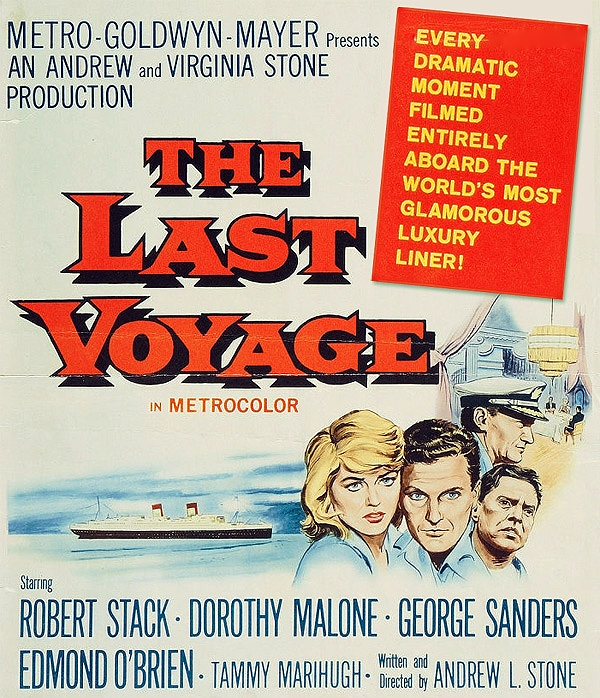 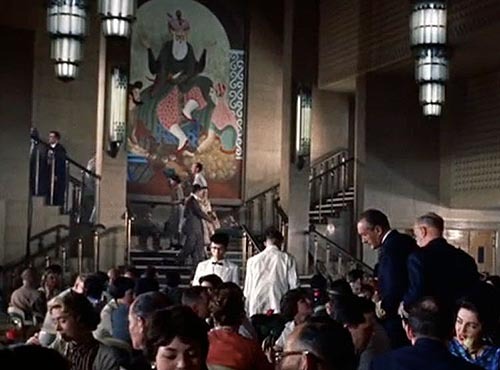 With the advent of transatlantic jet transport, ships like the Île-de-France fell out of favor, and by 1960 the grand ocean liner was reduced to serving as a floating prop for a disaster movie titled The Last Voyage. 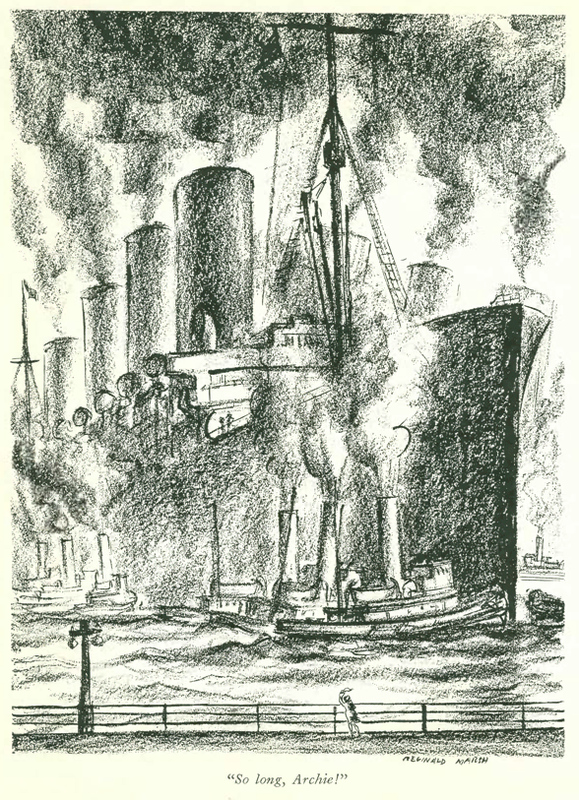 The filmmakers partially sunk the poor ship, set fires and detonated explosions in the interior, and in a final act of desecration dropped one for the ship’s smoke stacks onto its deck house. 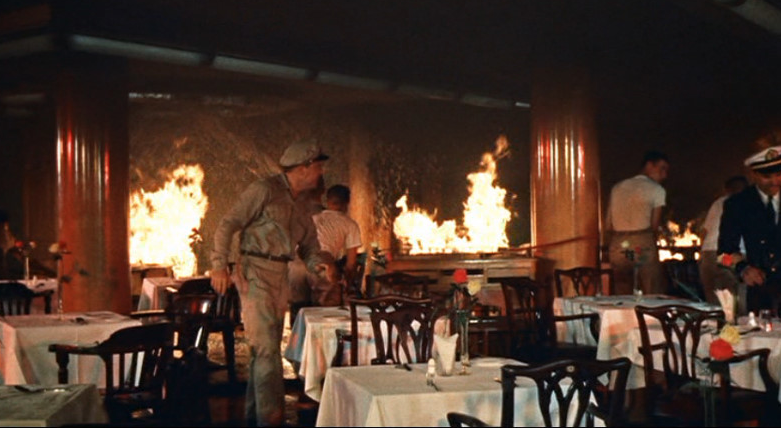 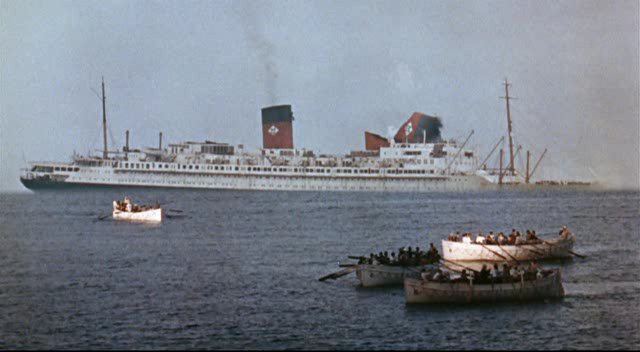 BROUGHT TO ITS KNEES…The Île-de-France (named the SS Clarion in the movie) is partially sunk with its forward funnel collapsed in a still from the film, The Last Voyage. 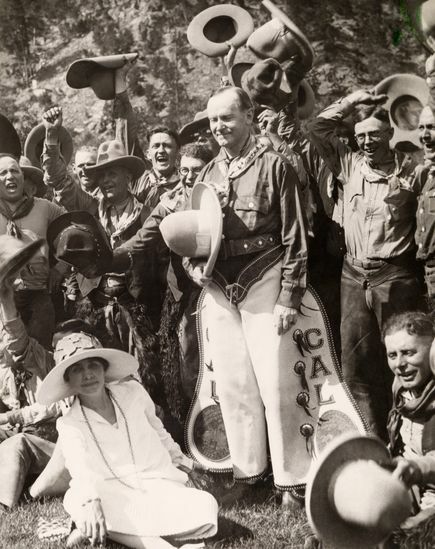 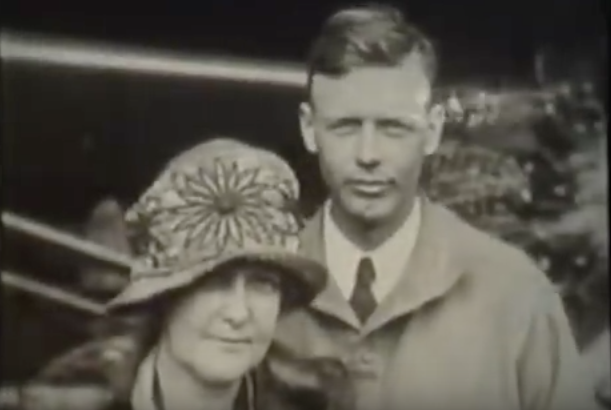 The Ruth Snyder-Judd Gray murder trial and sentencing captivated Americans in 1927, but another trial and sentencing in the 1920s would bring worldwide attention and spark mass protests. 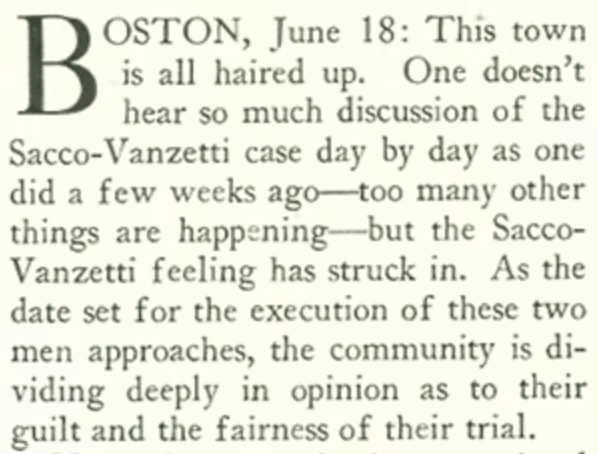 Nicola Sacco and Bartolomeo Vanzetti were Italian-born Americans who were convicted of murdering a paymaster and guard during a robbery of a Boston-area shoe company in 1920. 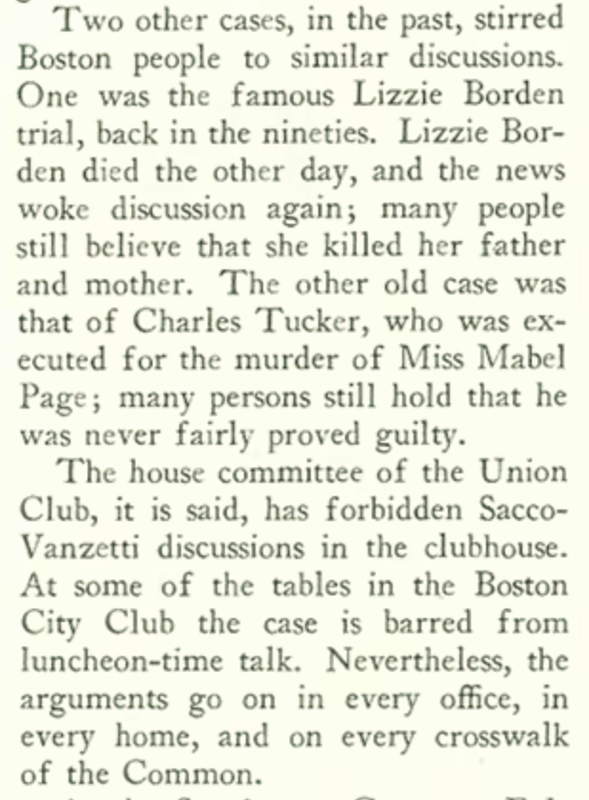 Although convicted of murder the following year, many critics of trial believed Sacco and Vanzetti, who held anarchist views, were innocent of the charges, and the case became one of largest causes célèbres in modern history with protests held on their behalf in major cities across the U.S. and around the world. 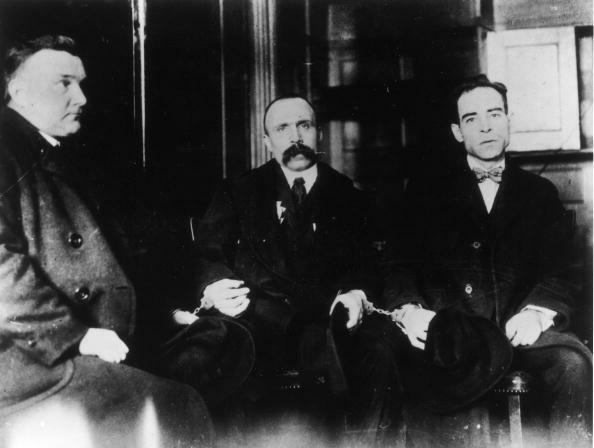 Cause Célèbre…Ferdinando Nicola Sacco and Bartolomeo Vanzetti handcuffed together at the Dedham, Massachusetts Superior Court, 1923. 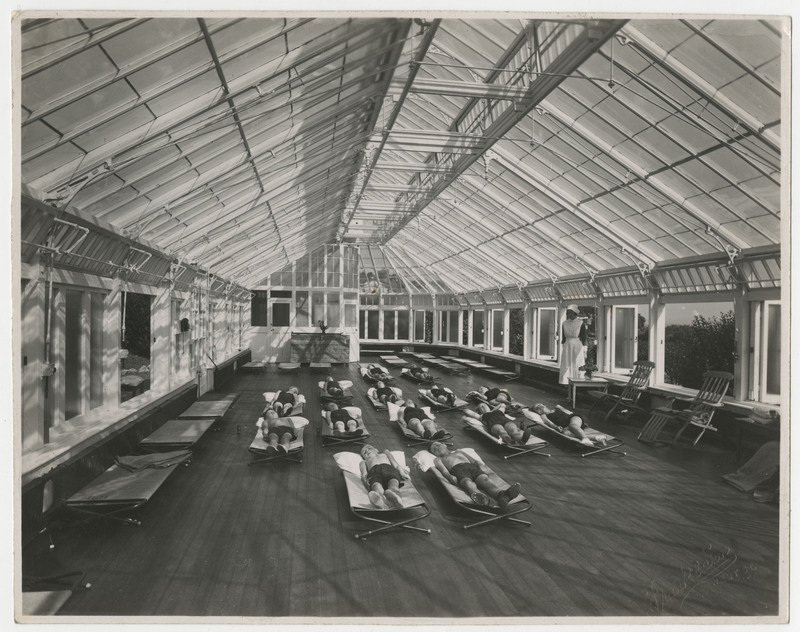 (Boston Public Library). 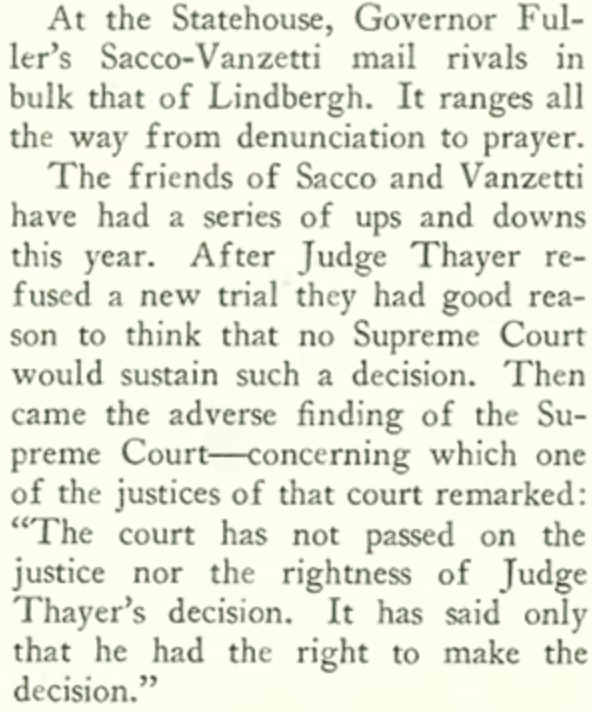 And so the only option left for Sacco and Vanzetti was clemency from the governor. 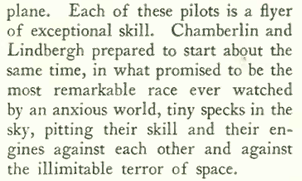 More on this in another blog entry. 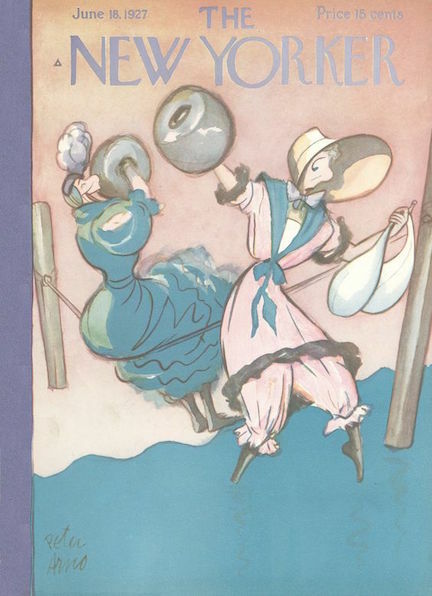 June 18, 1927 cover by Peter Arno, featuring his popular Whoops Sisters. 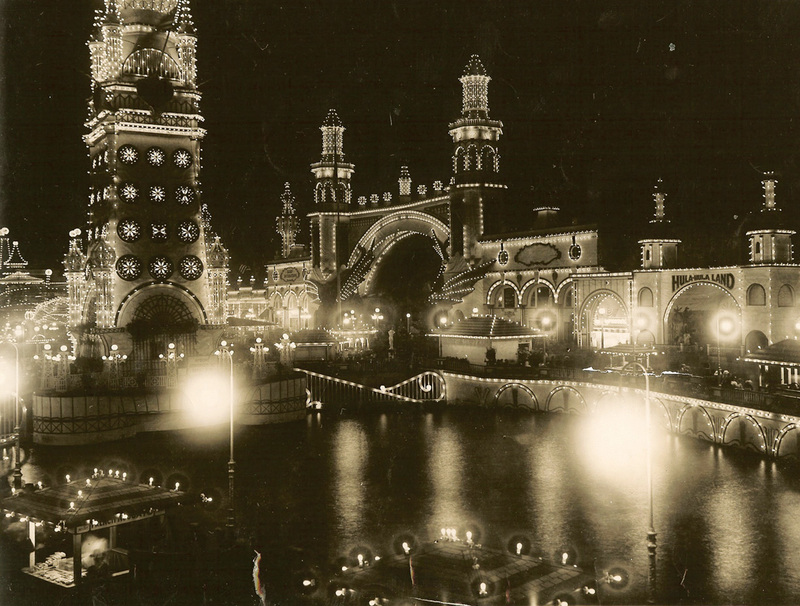 Of course not everything was as dazzling as Luna Park at night. 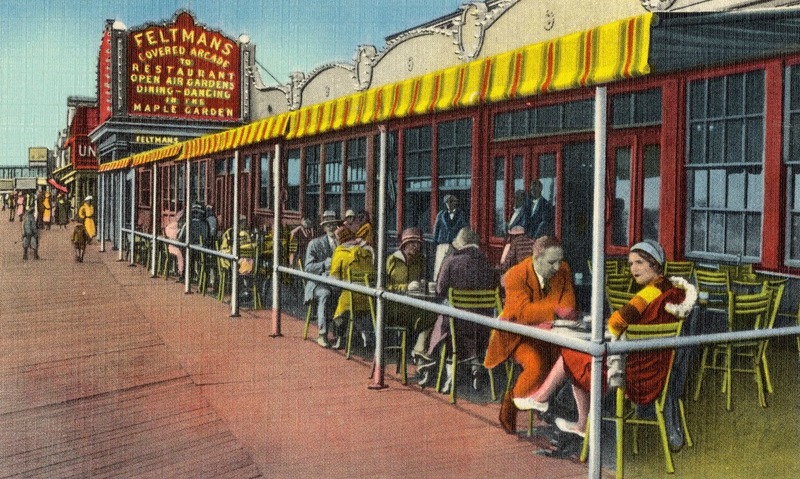 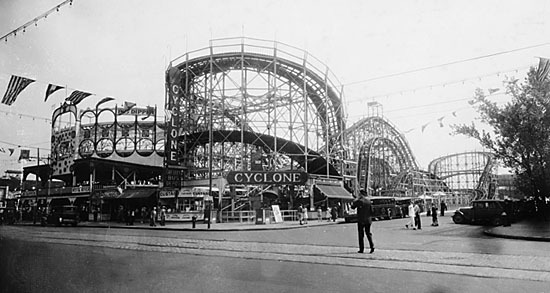 Like any carnival, Coney Island had its share of barkers announcing everything from games of “chance” to freak shows and a wax museum that depicted–among other grisly sights–the murder of Albert Snyder by his wife, Ruth Snyder, and her lover, Judd Gray, and the subsequent execution of the notorious pair. 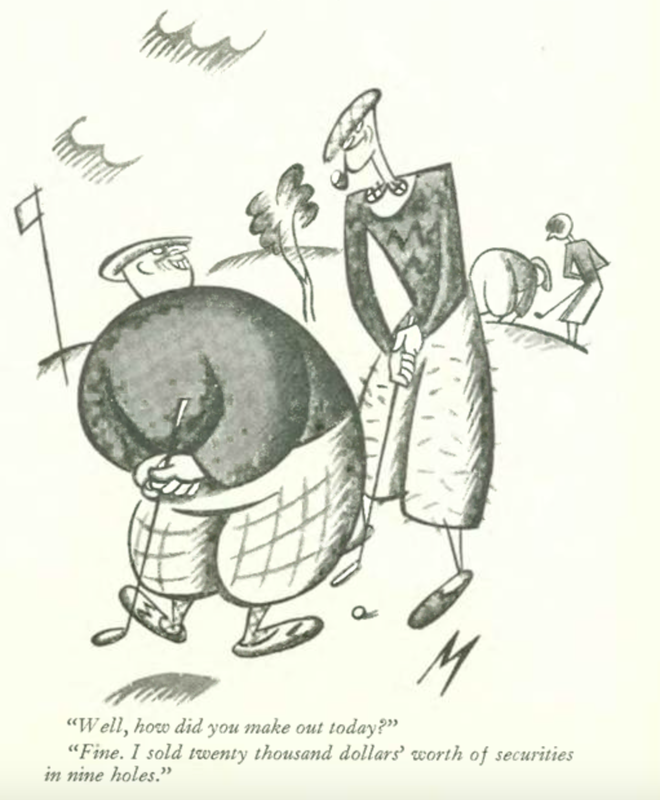 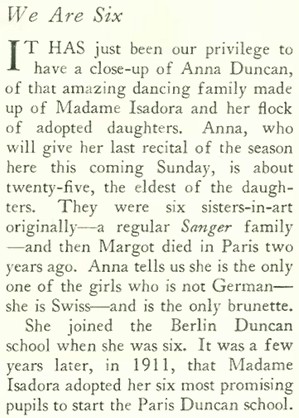 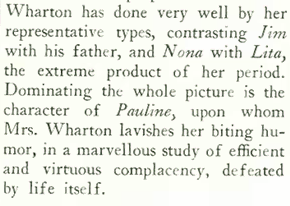 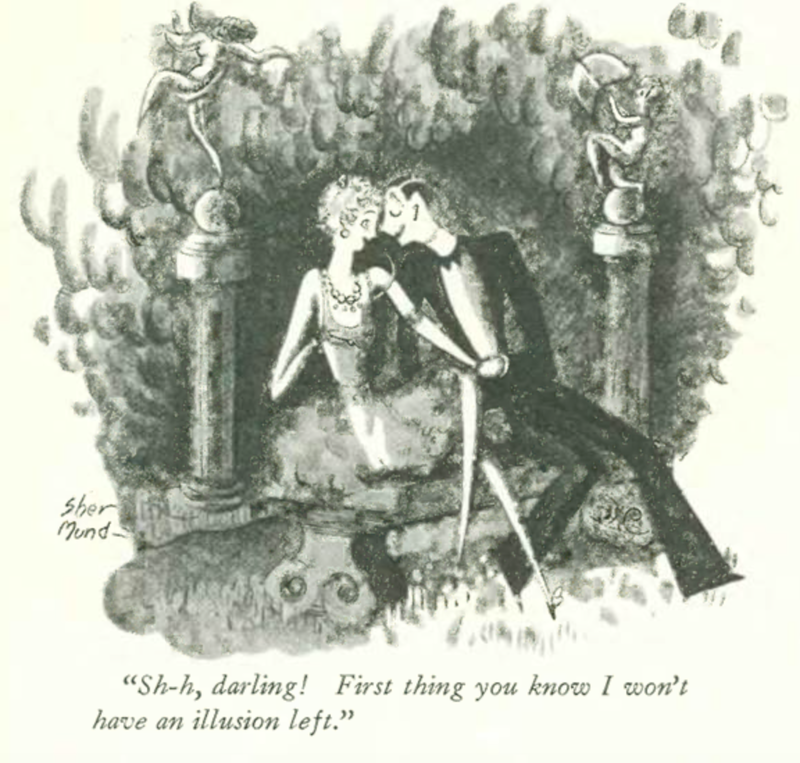 And perhaps there was another reason Long was taking a break–she would marry fellow New Yorker contributor and cartoonist Peter Arno on Aug. 13, 1927. 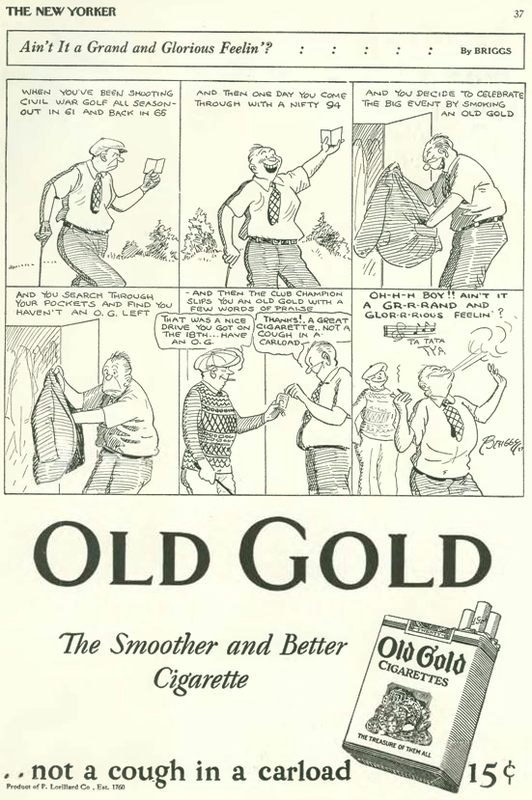 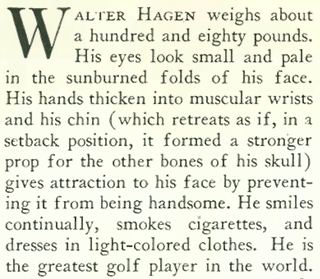 And finally, this advertisement in the back pages for Old Gold cigarettes, which claimed to be “coughless”…. 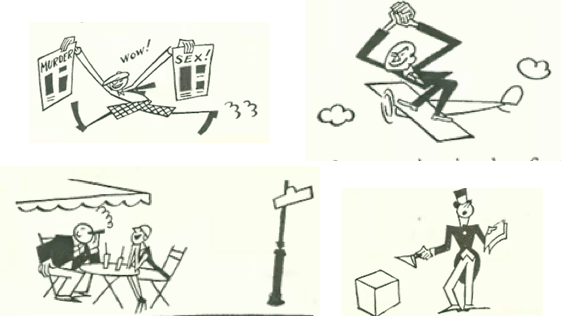 The artist for these Old Gold ads was Clare Briggs, an early American comic strip artist who rose to fame in 1904 with his strip A. Piker Clerk. 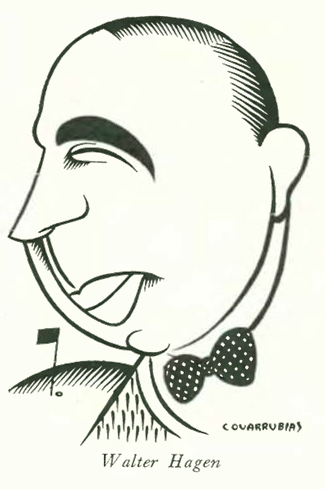 Growing up in Lincoln, Nebraska gave Briggs the material he needed to depict Midwestern Americana, a style that would influence later cartoonists such as Frank King (Gasoline Alley). 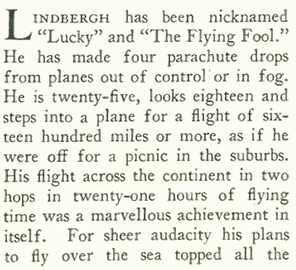 Charles Lindbergh was “The Flying Fool” no more after flying nonstop across the Atlantic to worldwide acclaim. 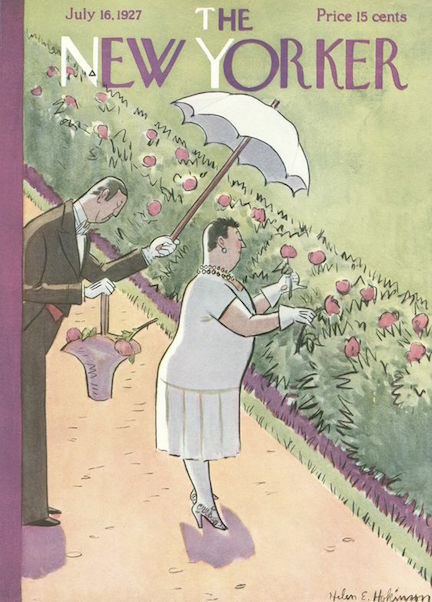 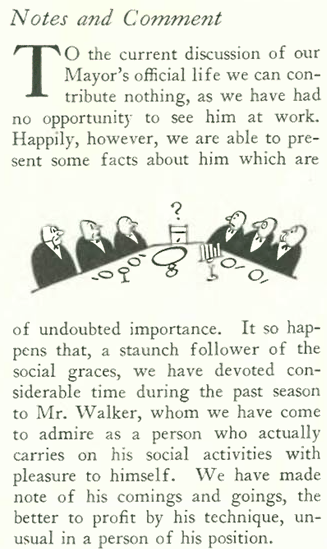 The New Yorker shared in the enthusiasm, although it tried its best to appear not too impressed by the feat. 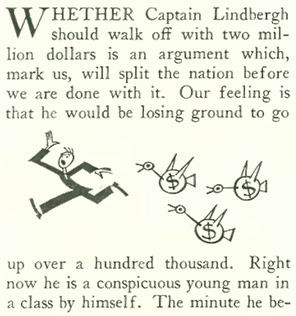 But as we shall see in subsequent issues, the New Yorker, along with the rest of the media, wouldn’t be able to get enough of the now “Lucky Lindy,” at least until he started spouting fascist sympathies. 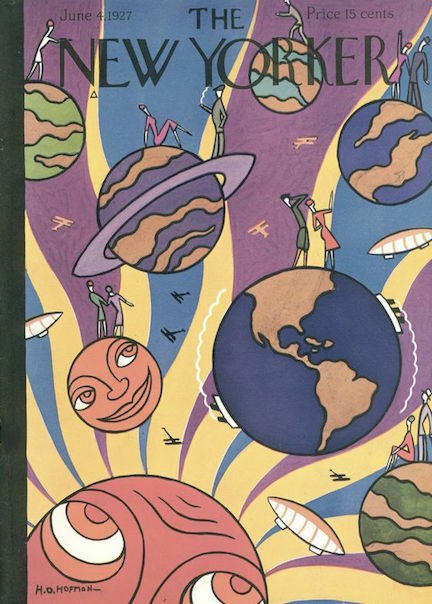 May 28, 1927, cover by Ilonka Karasz. 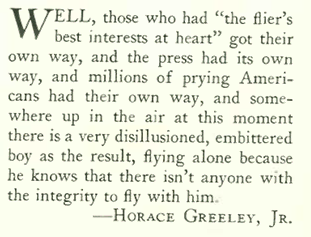 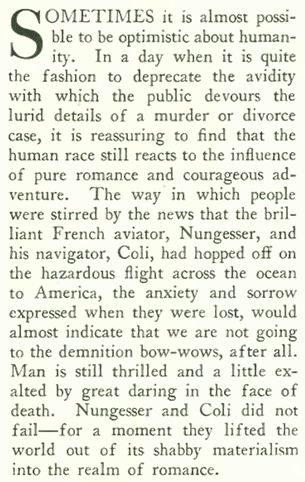 On the other side of the pond, Paris correspondent Janet Flanner wrote about the Paris media’s complete denial or ignorance of the deaths of their own Atlantic flyers, Nungesser and Coli, who were lost at sea in their crossing attempt. 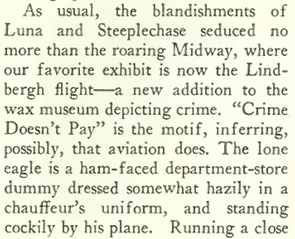 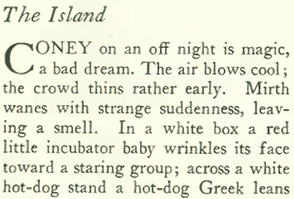 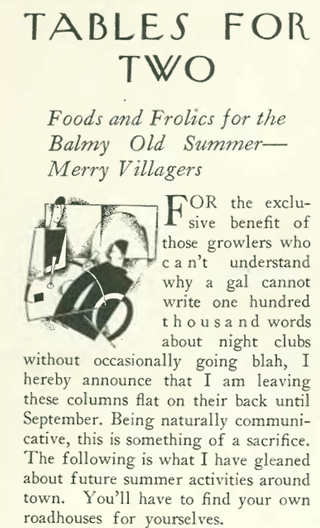 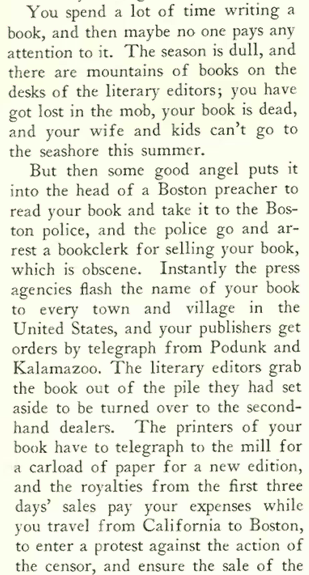 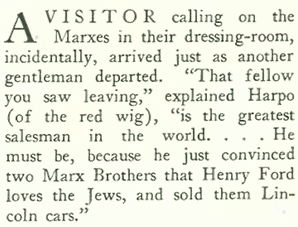 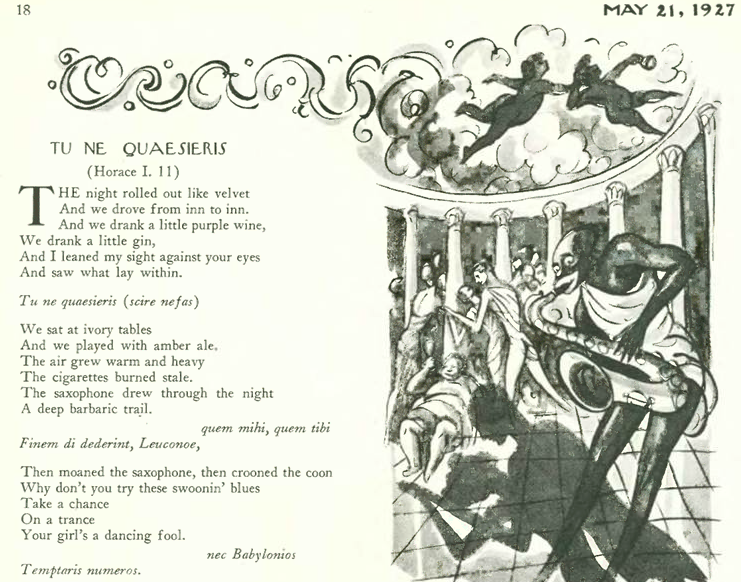 The New Yorker offered more observations on the Machine-Age Exposition, this time in a column titled “About the House,” by Repard Leirum, which was Muriel Draper spelled backwards. 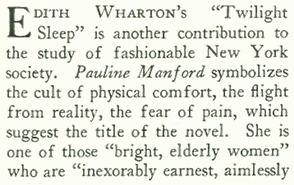 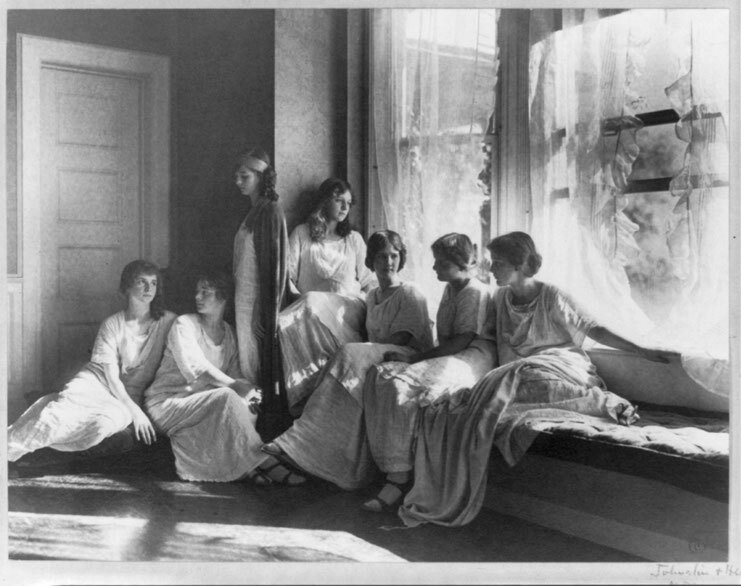 Under this pseudonym Draper served as interior decoration critic for the New Yorker — she was one of the most influential personalities in the American interior decorating in the early 20th century. 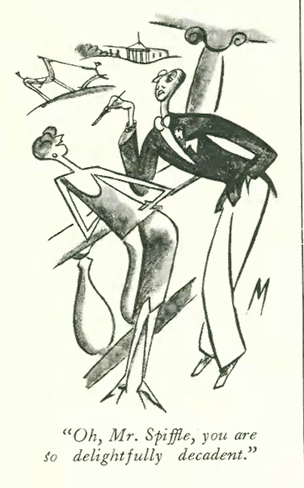 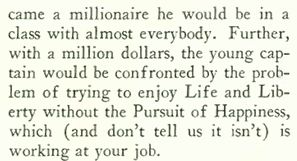 About Muriel Draper: Although she wrote on interior design for the New Yorker during the late 1920s, she was more widely known as a “culture desk” writer, and was prominent in promoting the Harlem Renaissance. 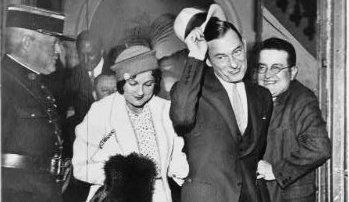 She became active in left wing politics after a trip to the Soviet Union in 1934, and in 1949 she was investigated by the U.S. House Un-American Activities Committee and thereafter ceased her political activities. 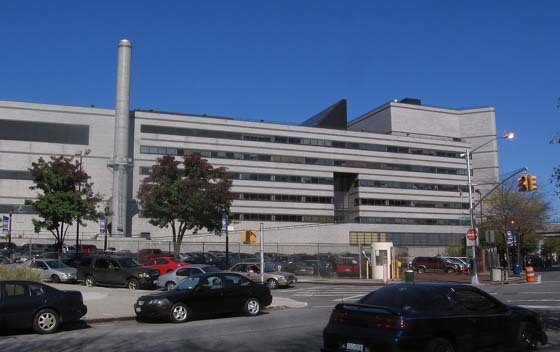 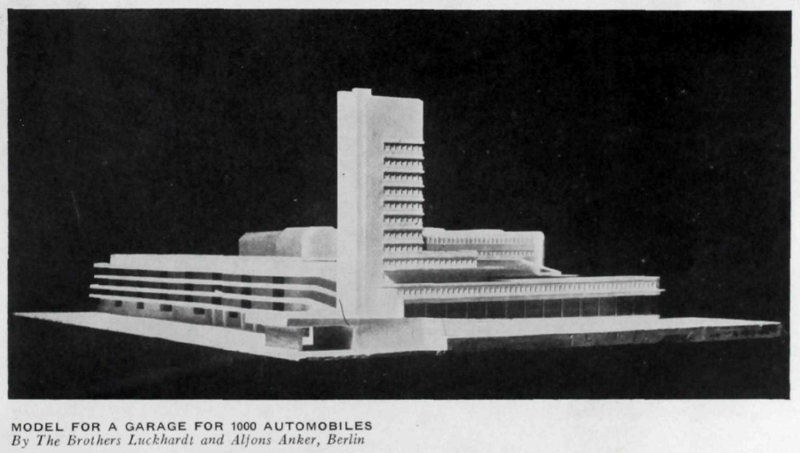 The Machine-Age Exposition Draper visited had a decidedly socialist flavor with its prominent inclusion of the Soviet Union and its touting of the International Style of architecture. 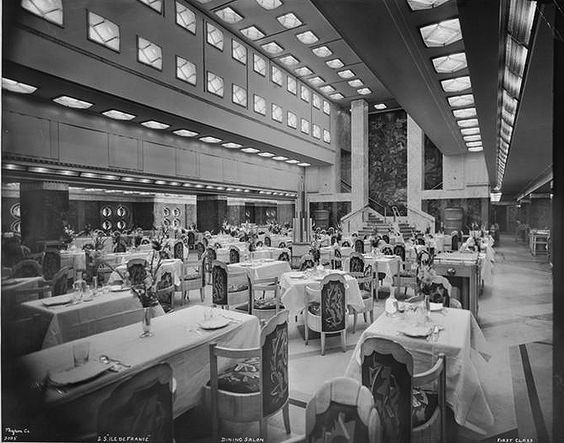 Before it was appropriated by post-war corporate America, the International Style was developed as housing and workspaces for the masses. 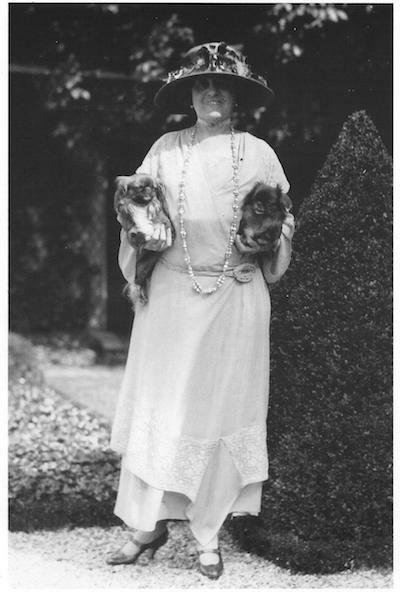 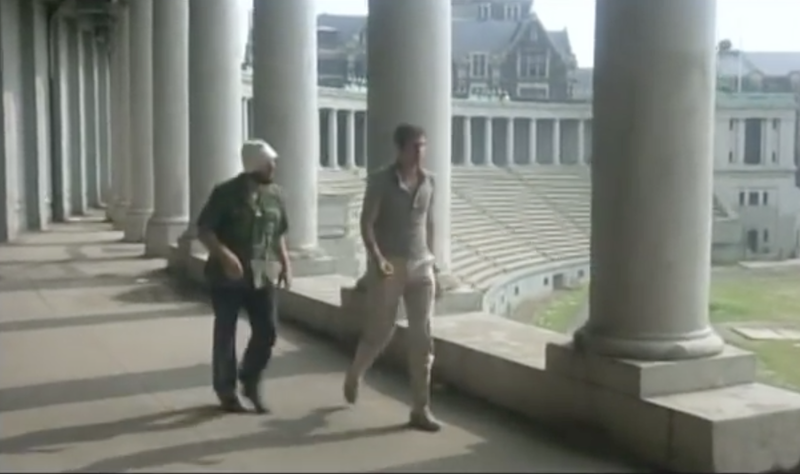 A side-note: The Exposition was initiated by Jane Heap, who like Muriel Draper was a follower of the charismatic Russian mystic G. I. Gurdjieff (among Gurdjieff’s other followers were architect Frank Lloyd Wright, the writer P. L. Travers (Mary Poppins) and 1960s counterculture figure Timothy Leary). 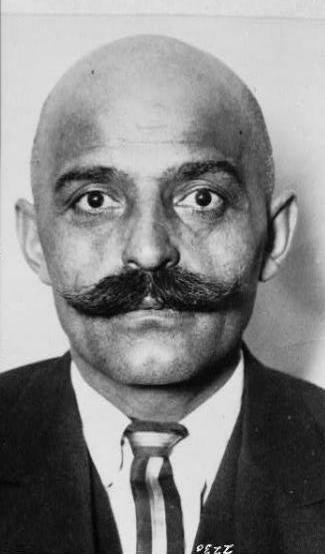 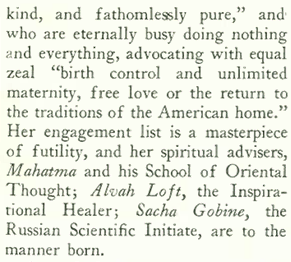 Marxists with spiritual yearnings — and especially guild socialists — were attracted to Gurdjieff’s ideas about something he called “The Work,” in which crafts and community life provided ways to cultivate a deeper understanding of ourselves and our purpose amidst the activities of daily life. 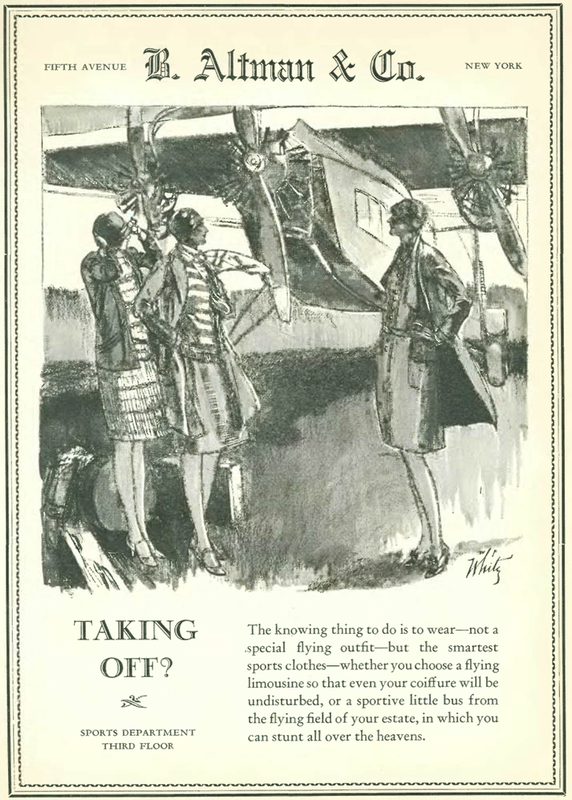 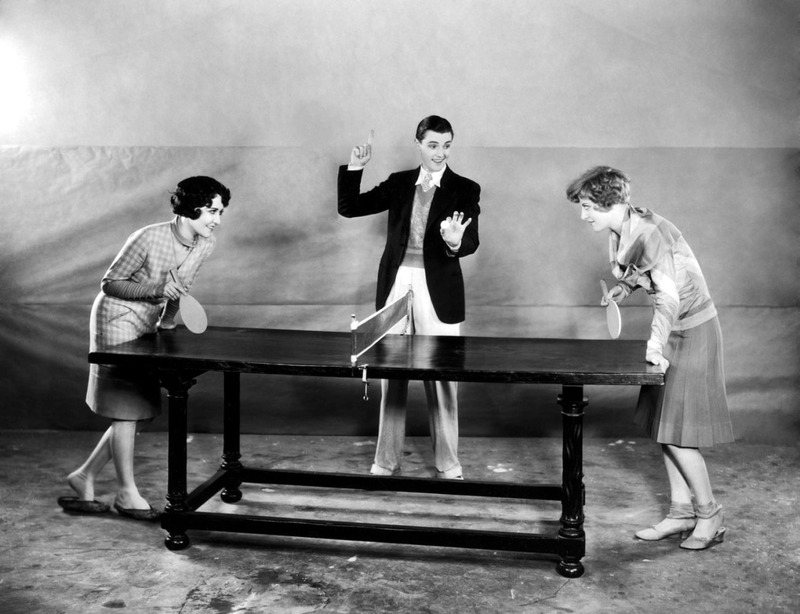 The Roaring Twenties saw astonishing changes to American life, including a dramatic break from the technologies and habits of the past. 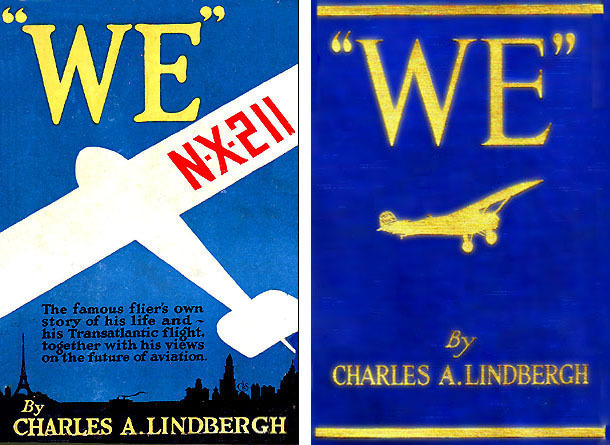 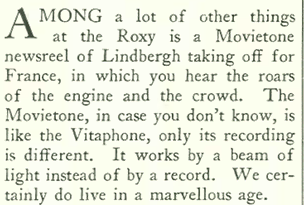 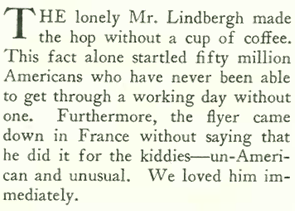 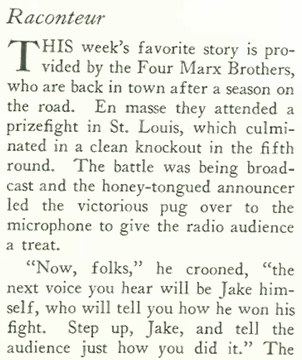 Icemen gave way to electric refrigerators, broadcast radio brought entertainment and news into living rooms, and Lindbergh made flying something everyone wanted to try. 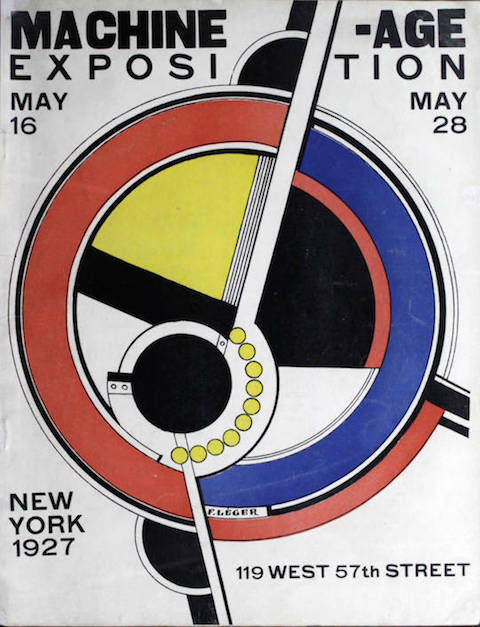 May 21, 1927 cover by Ilona Karasz. 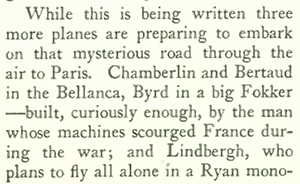 Despite the mechanized horrors of World War I, most people were enchanted by the idea of man and machine coming together to make a better world. 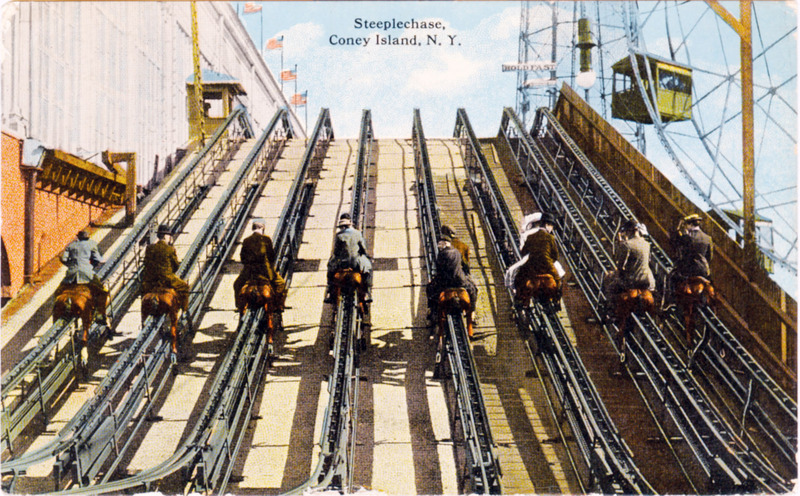 In the U.S. the machine-age exuberance was expressed largely in capitalist terms, while many European and Soviet intellectuals saw the machine as integral to the progress of socialism. 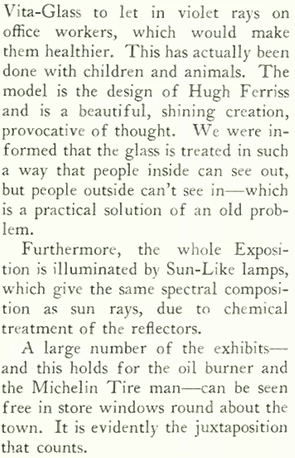 The Machine-Age Exposition in New York City (May 16-28 at 119 West 57th Street) celebrated all facets through a unique event that brought together architecture, engineering, industrial arts and modern art from a number of nations. 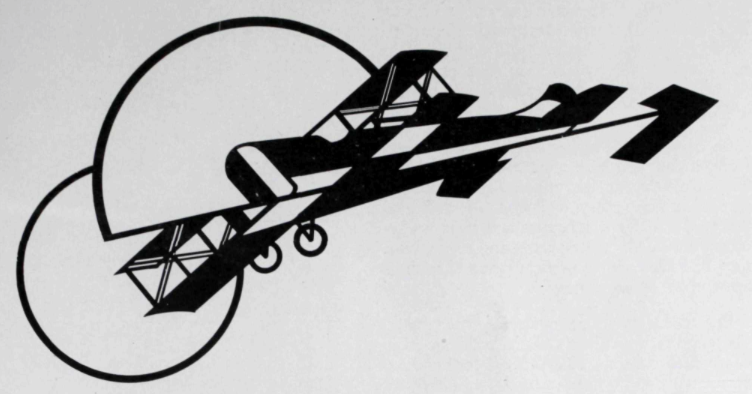 Scanned illustration of an airplane from the Exposition catalogue. 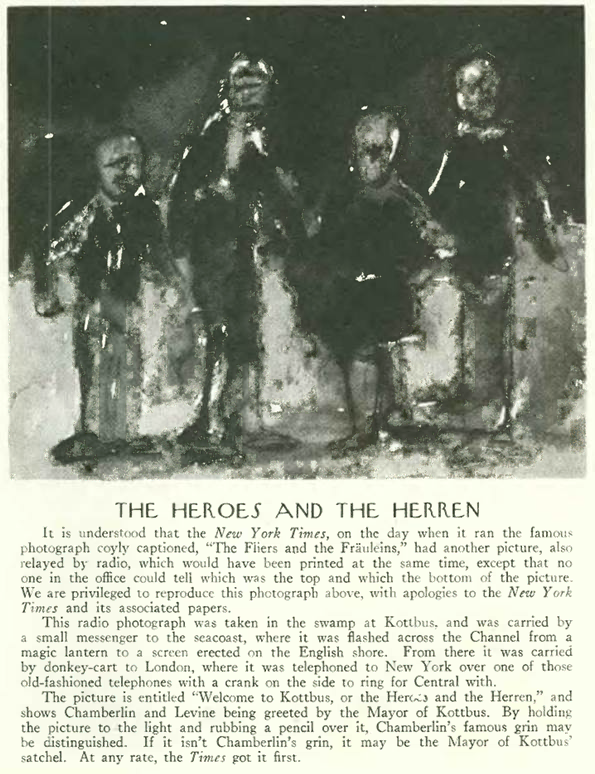 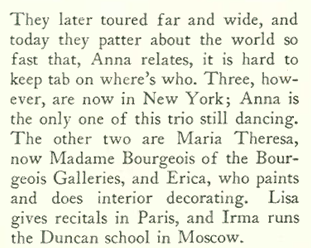 The exhibition, initiated by Jane Heap of the literary magazine The Little Review, included exhibits from the U.S., Austria, Belgium, France, Germany, Poland and the Soviet Union. 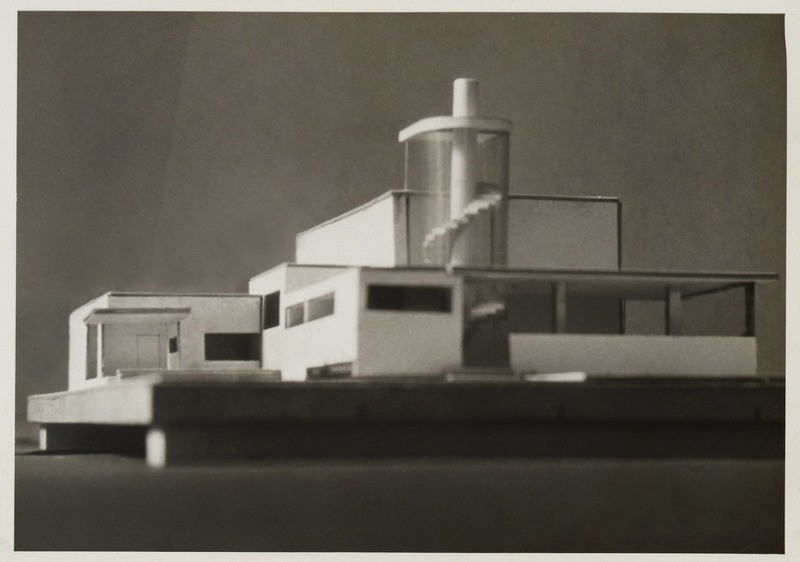 Artists in the exhibition represented a Who’s Who of modernists and futurists — Alexander Archipenko, Marcel Duchamp, Hugh Ferriss, Man Ray and others who celebrated the aural and visual cacophony of the age as well as the gleaming precision of machines and machine-like buildings. 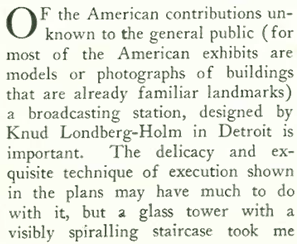 The sleek and glass-walled buildings featured at the Exhibition were fantastic images in 1927, when most large-scale buildings were still being rendered in brick and stone in various neoclassical, federal or gothic styles. 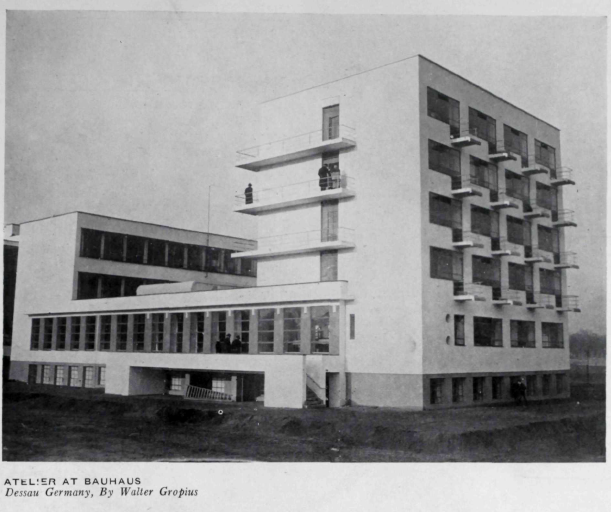 Little did visitors to the Exposition realize that the radical Bauhaus style on display would become ubiquitous in the U.S. in the second half of their century, thanks not to some new machine age of peace and harmony but rather because of the annihilation of the Second World War and the mass migration from Europe of architects, artists, scientists and other professionals fleeing Nazi oppression. 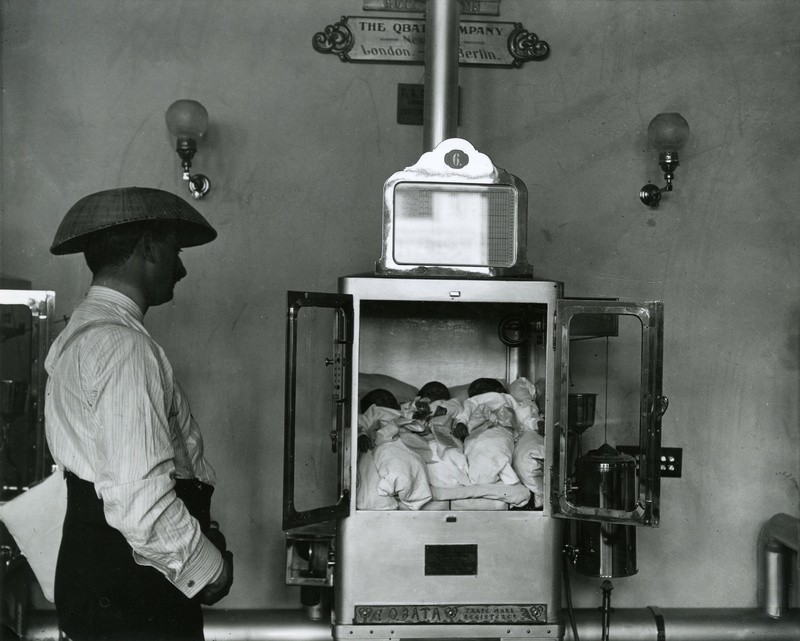 The invention of sulfa drugs and antibiotics were still a few years away, so health providers were excited about the possibilities of these artificial environments. 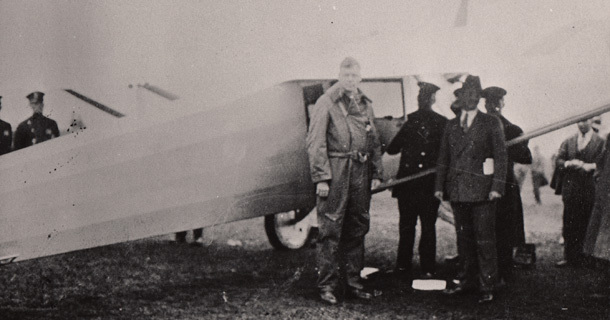 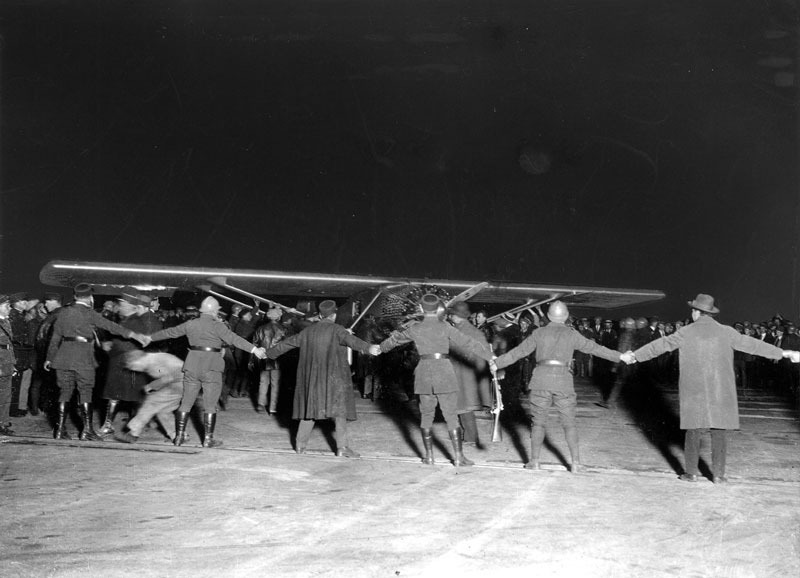 In the “A Reporter at Large” column, Russell Owen wrote about the intrepid flyers who were vying to become the first to fly nonstop across the Atlantic. 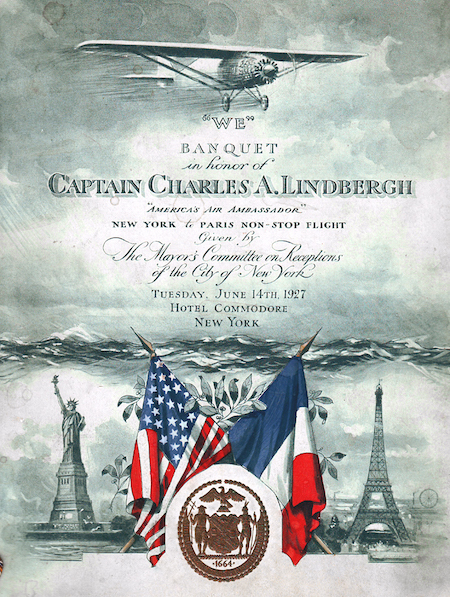 He began the piece with a tribute to French ace pilot Charles Nungesser and his one-eyed wartime buddy François Coli, who disappeared during their May 8 attempt to fly from Paris to New York. 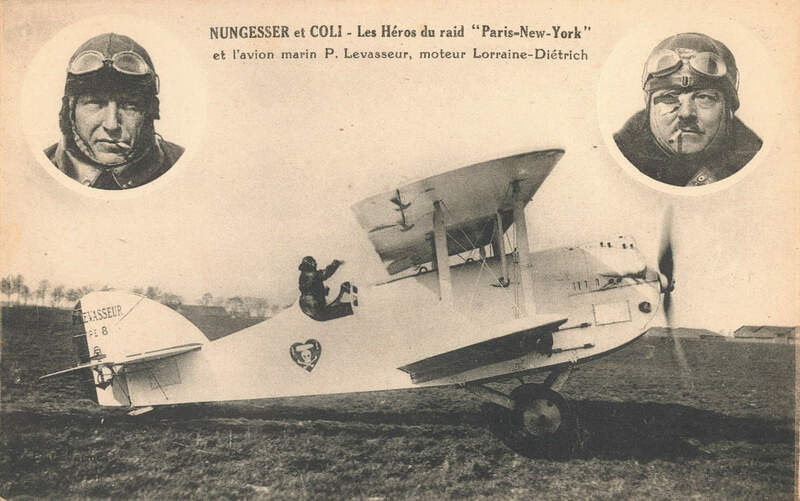 A 1927 postcard commemorating Nungesser, Coli and their airplane, The White Bird (L’Oiseau Blanc).